An enzyme is a biological catalyst that can accelerate a specific chemical reaction by lowering the activation energy but remain unaltered in the process. Most enzymes are proteins. Some are nucleic acids (RNA) like nbozymes. Enzymes have enormous catalytic power. They greatly increase the rate at which specific chemical reactions take pike. The metabolism of an animal is controlled specifically at some points. Catalysis takes place at this point. Therefore, catalysis is one of the most important Iiinctions in fife. Catalysis is a series of chemical processes. These processes are regulated by the enzymes. Thus the same reaction can occur without enzyme. But it will occur at a much slower rate. The enzymes remain unaltered. So enzyme can be used again and again. An enzyme is extremely selective for the *reaction. The reactants of enzymatic reactions are called substrates. The precise “fit” between an enzyme and its specific substrate is necessary for catalysis. For example, cellular concentrations of many reactants must be kept at low levels. It avoids undesirable side reactions. At the same time, concentrations of enzyme must be kept high for the required reactions. Thus the reaction occurs at a rate compatible with life. The enzymes channel molecules into specific chemical pathways. So the metabolism proceeds under these different conditions. All enzyme names end With the suffix ase. They are named after their substrate. But several digestive enzymes were discovered earlier. They do not follow this rule. For example, pepsin .and trypsin. Enzymes are three dimensional globular protein molecules or nucleic acids They speed up the chemical reaction in the living organisms. It has at least one surface region. This region has a crevice or pocket. This crevice occupies only a small portion of the surface of enzymes. This crevice is known as the enzyme’s active site. 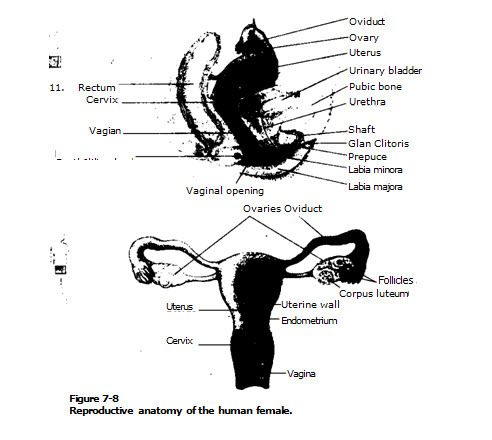 Active site has a specific shape. Therefore, a substrate molecule fits into it in a very specific way. Weak chemical forces like hydrogen bonds keep this substrate in place. The substrate binds with the enzyme. 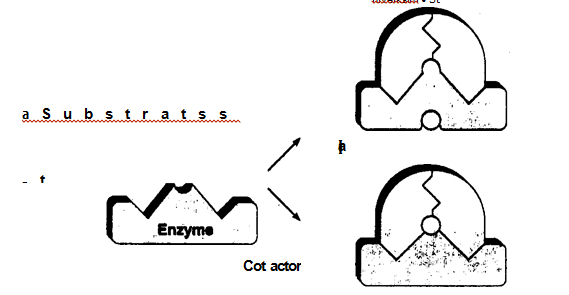 It changes the shape of enzyme. This phenomenon is called induced fit. The attachment of the active site with the substrate brings chemical groups of the active site into positions. It increases their ability to work oil the substrate and to catalyze the chemical reaction. When the reaction is completed, the product of the catalyzed reaction is released. The enzyme resumes its initial conformation (shape). It is ready to catalyze another chemical reaction. A substrate molecule binds with the active site of enzyme. Thus enzyme-substrate complex (ES) is formed. 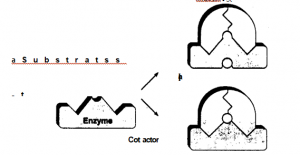 This is the first step in enzyme catalysis. The unstable amino acid groups of the enzyme form certain bonds with the substrate. Thus enzyme-substrate complex is formed. These side groups distort the substrate bonds. So it lower the activation energy needed to break the bonds. The bonds break. It releases the substrate. The substrate now reacts to produce the final product and release the enzyme. Some factors alter the three-dimensional shape of an enzyme. Thus they affect the activity of enzyme. Two factors affect enzyme activity. The hape of a ‘protein or nucleic acid is determined by its hydrogen bonds Temperature disrupts hydrogen bonds. For example, the enzymes of most of•birds and mammal have function in a narrow range of temperature. This range is between 35 and 40° C.
(a) L, w Temperature: The bonds of protein of enzymes are not flexible below C. So it does not permit the change in shape. This change of shape is necessary for substrate to fit into a reactive site. (b)H h Temperature: The bonds are too weak to hold the protein in proper p sition above 40° C. So enzyme can not maintain its shape. When proper s ape is lost, the enzyme is destroyed. 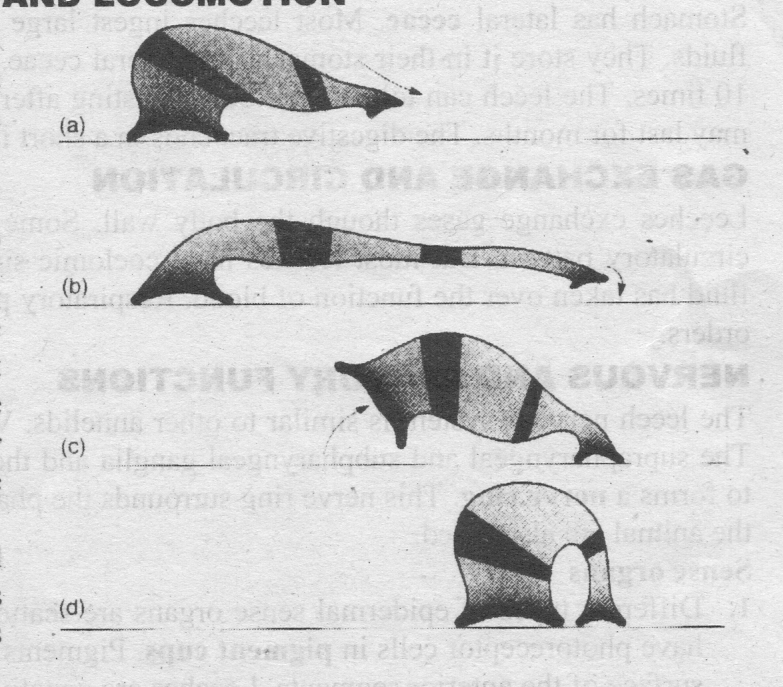 This loss of shape is called d naturation. Mos enzymes have optimum pH. This optimum ph is between 6 and 8. When pH is to low, the H+ ions combine with the R groups of the enzyme’s amino acids. So i reduces their ability to bind with substrates. Acidic environments can also denature enzymes. Attachment of a cofactor changes the shape of the protein and allows it to combine with its substrate. Pepsin has an optimal pH of 2. Pepsin has an amino acid sequence. This sequence maintains its ionic and hydrogen bonds. So it can function at such low pH. Trypsln is active in the more basic medium pH 9. This pH is found in the small intestine of mammals. The optimum pH of an enzyme shows the pH of the body fluid. Enzymes are found in this fluid.